Most indoor climbing walls are focused on the vertical ascent, and that can end pretty quickly. Zero Gravity has a traverse-style wall, so you don’t have to just go up and down. The traverse-style wall provides a much larger climbing surface and a longer challenge than the standard vertical indoor rock walls. Many people mistakenly think all climbing walls essentially are the same – a gray wall that simulates granite with various pieces added for footholds and handholds. 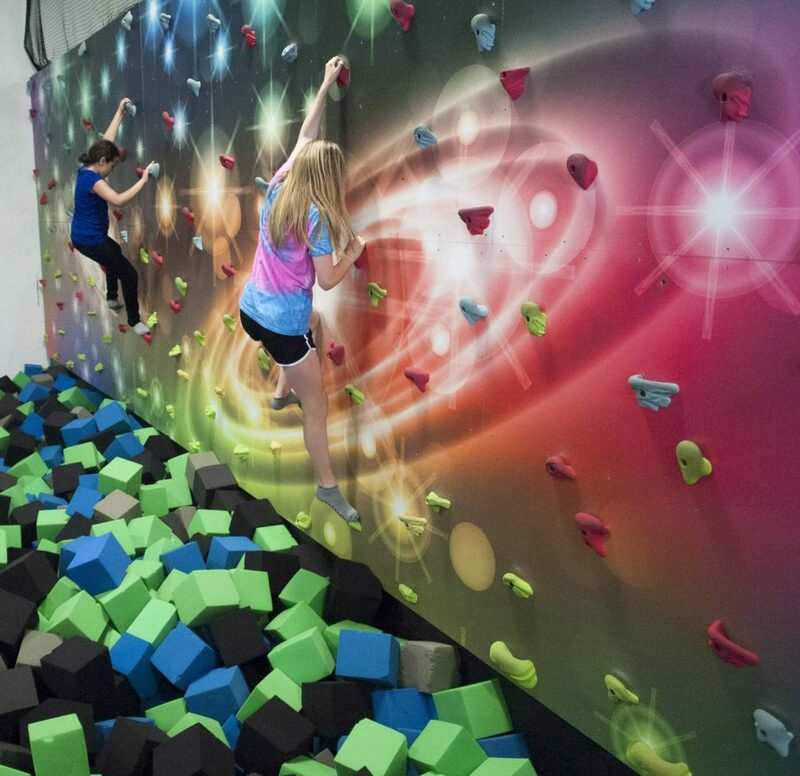 Zero Gravity, however, goes way beyond a simple rock wall and creates a truly out-of-this-world experience with an outer space-themed climbing wall and room that makes the climb one of the most interesting and fun anywhere. It could be zero degrees outside, but you still can have otherworldly fun while climbing among the stars. *Includes 2 1/2 hrs of unlimited use of everything in the park including: Trampolines, Climbing Wall, Aerial Challenge Obstacle Course, and Laser Tag. While most climbing walls require special climbing gear, you don’t need any such thing at Zero Gravity Trampoline Park. No special harnesses, climbing shoes, gloves, helmets, or other gear to worry about, because the landing area is lined with soft foam pieces that completely soften any fall. Your kids will love it! Possibly the best part about the climbing wall at Zero Gravity is that it does not cost anything extra to use it. You just pay the standard entry fee, and the rock wall is included with your trampoline jump pass. We also have Party Packages to fit any size group or budget, Zero Gravity is the place to hold your next birthday party, group celebration, or team building event near Minneapolis, MN. Private party rooms are available for groups of 10-40 guests. Book online now or call us at (763) 231-3033.